How they got the name Buckyballs is beyond me, but these 216 magnetic spheres are super fun to play with! 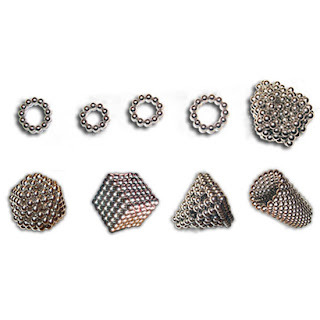 Each ball is a rare earth magnet with a positive and a negative pole, so they stick together in chains, squares, and tons of other shapes. Instructions to make a variety of geometric wonders are included, and the balls come in a handy travel case to keep them all together--though their magnetism is fairly strong, so they stick together very well on their own! They can also be mushed up into a shapeless mass that's fun to massage in your hand when your attention isn't focused enough for pattern-making. Best of all, the carrying case and Buckyballs all together are small enough to fit in a purse or tote or glove compartment, making them easy to bring along wherever you're going. I've been feeling like coloring lately, but the average coloring book is too dull for me. Luckily, we have tons of interesting and unique coloring books to choose from! 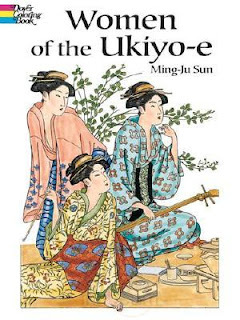 My favorite today is Women of the Ukiyo-e, a coloring book adaptation of thirty classic woodblock prints and paintings of Japan's Edo period (1615-1867). Not only is each page beautifully rendered, but they all include a snipped of information about the original work and artist. Of course, aside from all that learning, there are also plenty of pretty patterns and kimono pieces that require more delicate attention than the average coloring book, which is just the kind of activity I love. That's it for now--see you next time! It's here, it's here, it's finally here!!! You make walls crawl, Jack! Nothin' left for me to do but dance.